For the second year running, I attended the New York Art Book Fair, hosted annually by Printed Matter. The fair is crowded and chaotic, even if you go before the weekend, but it’s an unmatched opportunity to see a variety of work by artists from around the world. You’ll see ultra luxe handmade books, photocopied zines, and everything in between. One thing I love about the fair is its mixture of printers coming with their latest work and historical material like vintage newspapers and even surrealist-era work. There’s something for every interest at this fair. Personally, I collect books and prints printed on risograph machines. When I first started collecting riso books, I could pick up a couple of books at a book fair, but the technique has become increasingly popular over the past few years. At the NYABF, most of the exhibitors in the zine tent and a number of people inside the building were using riso. Somewhat between a Xerox machine and a screenprint, risograph prints are inexpensive, imprecise, and charming. Only one color can be printed at a time, and the mechanics of the machine make exact registration unlikely. A handful of printers have learned to coax immaculate work from these machines, some even printing faux-CMYK images through the use of four color printing, but generally, they have an immediacy from the semi-transparent soy inks, uncoated paper, and misaligned layers. To learn more about riso, try Stencil.wiki, which collects risograph printers and information on the machines. Around the turn of the 20th century, in the wake of William Morris’s highly influential Kelmscott Press, we tend to see other private presses reacting to his style, either mimicking the elaborate decoration, borders, and limited white space or aggressively rejecting it. Of the presses who embraced the Morris style, a favorite of mine is Eragny Press. Pictured above is their printing of Francis Bacon’s Of Gardens, an essay that greatly influenced English gardening. Run by Esther Pissarro and her husband Lucien, son of famous painter Camille Pissarro, Eragny Press continues the dedication to craft and Arts and Crafts-style visuals of Kelmscott Press, but brings a more delicate touch to the style. The art nouveau and Japanese influences lend an elegant simplicity to the floral patterning, and the overall effect is decidedly more minimal than Morris. The Pissarros are also notable for their use of color, again influenced by Japanese design. Just a few shades off from primary colors, the orange-red and spring green pictured above lend freshness to the page. The private press movement was all about handcraft and high-quality materials to perfect the physical form of the book. While you may debate what exactly constitutes a perfect book, these books are absolutely gorgeous in person. There are 200 copies of Of Gardens, many of which are held in libraries; check and see if a library near you has one. 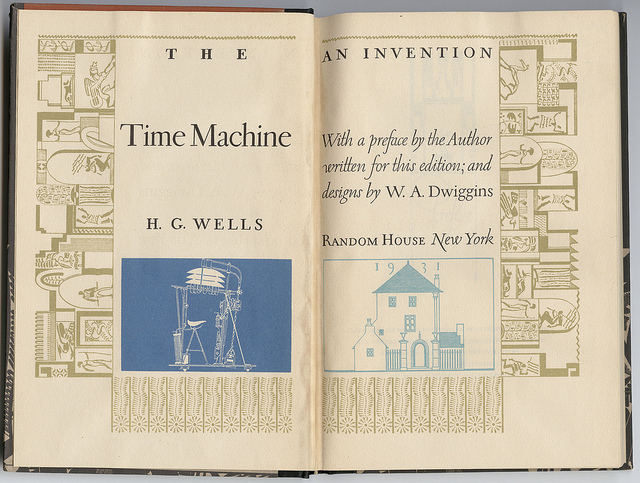 W. A. Dwiggins, known for being the first person to call himself a “graphic designer,” is a hugely influential figure in type and book design, particularly in the 1920s and 30s. After publishing An Investigation into the Physical Properties of Books, in which he decried the decline of book design in the early 20th century, he began working with publishers like to produce thoughtfully designed books. In fact, Alfred A. Knopf, the publisher with whom Dwiggins had closest ties, still publishes “a note on the type” in the back of their books today. Dwiggins has an idiosyncratic color and design sense, influenced by his love of Japanese and Chinese design. This sensibility combined with art deco aesthetics make Dwiggins’s illustrations and designs both evocations of his era and also immediately, uniquely recognizable as his own work. The Time Machine, published by Random House in 1931, brings some of the qualities of fine press publishing to the commercial world. The illustrations, use of color, and typography draw attention to the physical book not just as a reading device, but as an accessible work of art. C&C Press has collaborated with writer Luis J. Rodriguez on several books, the most recent being 2007’s Making Medicine. This accordion-bound book combines Rodriguez’s poetry with unusual imagery to memorable effect. C&C Press is well worth your attention; their work is intelligent, bold, self-assured. I previously wrote about another book of theirs, Gary Young’s In the Face of It, here. Making Medicine can be viewed at a pretty good number of U.S. libraries; find the closest one WorldCat. Reading a book is inherently participatory: you set the pace, you turn the pages, and you decide what it all means. In Ann Tyler’s Billy Rabbit: An American Adaptation, the reader’s participation is used to chilling effect, forcing readers’ hands to hold tools used in a violent lynching. The book starts off innocuously, fully embracing the classic Billy Rabbit story and its nursery-rhyme comfort. As the book continues, images of barnyard tools, often life size, printed on sewn-in sheets of translucent paper lay over the text, encouraging the reader to pick the tool up by the handle to read the text. This is great fun at first, like an invitation to enter the world of the story, but by the time readers realize exactly what world this story takes place in, it’s too late: the weapons are already in hand, and Billy Rabbit’s murder is imminent. My personal notes and other descriptions I’ve found use the word “glee” to describe the book’s mood; this momentum lasts throughout, even as the story turns to crushing a man’s bones, taking pieces of him as souvenirs. While suffused with a sense of unreality from the childlike storytelling, the violence is visceral. It feels grotesque and cartoonish that all this violence stems from a stolen turnip, but in truth we know lynch mobs needed very little to justify their actions. This book succeeds in making a familiar part of history feel new, and all the more raw and horrific for it. This is one of three books by Tyler about lynching; find more information about her work here. This particular book can be found in libraries across the United States. Charles Hobson’s Writing on the Body pairs writing by Degas about drawing the human body with photogravures by Hobson. Hobson, bookmaker and artist, made the work to explore the influence Degas’s work and writing have had on his own drawings. The book quotes Degas: “A picture demands a certain mystery, vagueness, fantasy.” These images fit the bill: imprecise, but still inviting. These headless bodies are both quick and repetitious, like sketches drawn and re-drawn until the contours were just right. Hobson likes using layers in images, and this book’s use of Degas’s handwriting over the sketches makes his influence on Hobson a literal part of the images. The handwriting also lends the images an expansiveness of time: the time spent absorbing an artist’s point of view, the years of drawing and observation necessary to build a strong point of view in the first place, the years between Degas’s work and Hobson’s. The final experience feels, despite the cleanliness of the book’s layout, like peering into an artist’s notebook and watching him try again and again to capture the magic of the body. The book is a fine homage to Degas, an exploration of the human figure, and an ode to influence. Only 45 copies were made, a number of which are available for viewing in libraries across the United States. During the creation phase, I kept feeling a pull between my desire to create something beautiful and balanced from the shapes and the impetus to be honestly contemplative, but I was ultimately able to use the game board to reflect genuinely on myself. The much more challenging part comes next: Chen asks every player of the game to record their map and some additional information (a title, notes about the experience, et cetera) in a ledger. This is a nerve-wracking request. First, writing in books in a special collections reading room is pretty much always expressly forbidden, and sitting in a room full of researchers and librarians while permanently inscribing my information into a work of art felt illicit and strange. Second, Julie Chen is immaculate in her craft; you’ll never find another book artist who is as neat, as detailed, as obsessively perfect. In tracing the small models of the map pieces used to record, I felt very, very nervous about ruining her work. I was worried I would write something down and then change my mind about it, worried even to put down the time and date. And perhaps most importantly, I didn’t want to make what I had done and thought about official and final. I wanted that stuff to hang out in my mind, instead, where I could change or forget it later. Some of this is my own neurosis and some of it, I think, is part of the piece. There exists an enormous gulf between thinking/feeling and recording, and a scary one–it’s tough to know you might get it wrong, especially when you only have the one chance to say what you mean. Flipping through the ledger allows readers to see how others confronted this challenge, and what about the experience they most wanted to share in the limited space, but in my mind the primary function of the ledger is definitely the writing, not the reading. Writing in the ledger gives a taste of the experience of making art–fussing over details, attempting to figure out how to bridge between a thought or experience and its communication, anxiety about being seen and understood. I’m writing about this experience today in part because the area of my life I was supposed to be contemplating was the future, and going back to my notes about the game allows me to see what I wanted from my future two years ago, leading to another round of contemplation. In my notes from the experience, I call the ledger entries “weird abstract journals,” but however weird and abstract, mine still resonates with me today. If you have a chance to play the game at a library near you, plan to spend at least an hour playing and recording your game.